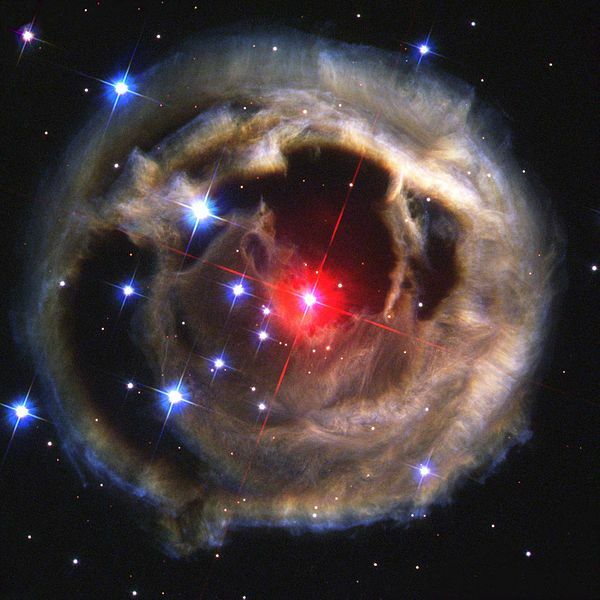 For astronomers and aficionados of cosmic violence, an obscure star known as V838 Monocerotis has turned out to be a gift that has kept on giving for a long, long time. In January 2002, a dull star in an obscure constellation suddenly became 600,000 times more luminous than our Sun, temporarily making it the brightest star in our Milky Way galaxy. The mysterious star, called V838 Monocerotis, has long since faded back to obscurity. But observations by NASA’s Hubble Space Telescope of a phenomenon called a “light echo” around the star have uncovered remarkable new features. These details promise to provide astronomers with a CAT-scan-like probe of the three-dimensional structure of shells of dust surrounding an aging star. The star forms part of the shoulder of an imagined unicorn in the constellation Monoceros, 20,000 light-years away, and in January 2002, astronomers saw it blow up. Over the next few months, it became a million times as luminous as the sun and swelled in diameter to a billion miles, comparable to the orbit of Jupiter. It was briefly one of the most luminous stars in the galaxy. Astronomers are still arguing and speculating about what happened. Measurements of the star’s light output showed that the explosion happened in three stages, flaring and then dimming three times from January to March 2002. Some scientists have suggested that V 838 swallowed planets in its orbit. Others have proposed that V 838 was actually two stars orbiting each other, and that the explosions were a result of their atmospheres merging into a common envelope of gas. The answer could be relevant to our plight. Someday, a few billion years from now, the sun will run out of fuel and become a red giant,swallowing Mercury and frying the Earth and Venus. Whatever it was that made V 838 erupt, astronomers are still watching it go. The star, it turns out, is embedded in a cloud of dust trillions of miles across. Most likely, astronomers say, these wreaths of dust gave rise to V 838 perhaps four million years ago. They would usually be invisible, but the pulses of light traveling outward from the explosion have illuminated shells of dust previously kicked off the star. The Hubble Space Telescope has recorded images of these so-called light echoes, and viewing them in succession calls to mind the explosion of Darth Vader’s Death Star — except that in this case, nothing is moving but the outward-rushing light wave; the dust is standing still. As a result, the death of V 838 Monocerotis is giving astronomers a rare look at the circumstances that gave it birth. Dust to dust and ashes to ashes. So it goes. Nothing lasts forever, but in the universe, nothing is ever really gone, either. As the Columbia University astrophysicist Caleb Scharf pointed out in an essay on his blog recently, long after you and I are dead, the light reflected off our faces today will still be traveling across space, ever fainter with distance, but always there. For somebody with a big enough telescope somewhere, we will be immortal.